We had made some potstickers the night before for a party and I need them made again so I could take some photos. Zo asked what we were going to have with them and I said, "I have no clue!" I started rummaging through the fridge and said, "You know if we grab some soyizo or chorizo we could make up some New Mexican Egg rolls!" Then after spying a tasty sauce in the fridge I finished up with "Oh and we could dip them in that yummy sauce I made for the chicken dippers!" Zo replied that it might be pretty good and we should do it. So while she made up a new batch of potstickers I tweaked and pinched away at the ingredients until I thought they tasted right and then we fried up everything all together. These were tasty! After eating them I told her we should make them for her mother when she was in town and Zo said, "I was thinking the same thing!" I hope you enjoy! Heat olive oil in a large skillet over medium low heat. Once heated add potatoes, chorizo and green onions to skillet and cook for 12-17 minutes, stirring often. After potatoes are cooked through and chorizo is browned, drain oil from mixture and pour into a large mixing bowl. Fold mixture with renaming ingredients until mixed well (except egg roll wrappers and oil.) 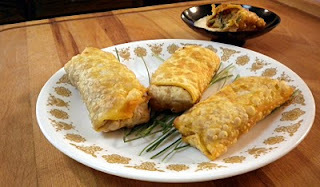 Add even amounts of mixture to egg roll wrappers. Fold in the ends of the wrapper and then roll both ends closed. Heat vegetable oil in a sauce pan over medium high heat. Once heated add egg rolls 2-3 at a time and cook for 3-4 minutes or until browning. Once browned sit on a paper towel covered plate and let cool 2-3 minutes before serving hot with sauce. Enjoy!